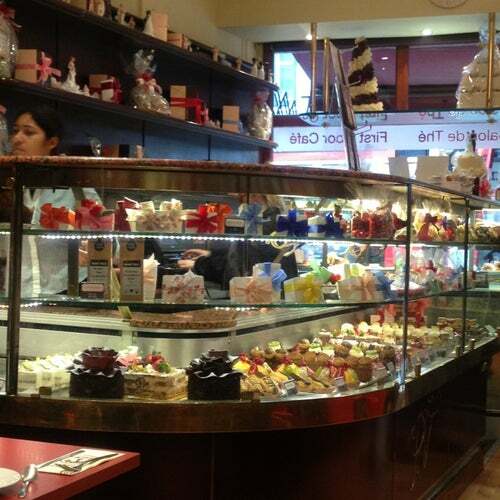 There was a time when Valerie's was a byword for swish cakes and special occasions, or the place to enjoy a quiet morning coffee and croissant among Soho's media movers and shakers. But earlier this century the business expanded and the three brothers sold their shares. Patisserie Valerie is now a chain stretching well beyond London (including motorways), with the Danish and tall cakes produced in a production facility in east London. And sadly it shows. The Soho branch is still the flagship and still worth an occasional visit — you can get a decent cup of coffee or tea — but it's lost dollops of the charm and atmosphere that once made it the jewel of Old Compton Street. And the cakes, pastries and doughnuts are rather industrial, without a hint of the artisan quality you'll find round the corner at Maison Bertaux in Greek St [see entry]. The famous custard doughnuts and mille-feuille are no longer worth having, and they've stopped doing brioche. Allegedly designer Paul Smith owns the lovely old red-top tables that partly defined the space and which have been replaced by something altogether faux-feeling, sadly in keeping with the other aspects of the business. As of 2017 there are nearly 40 branches in London, with a baker's dozen in Scotland. In January 2019, owing to fraud, the company went into administration, with this flagship branch among the closures. Watch this space. This is not the Valerie of yore. The coffee might be just good enough, but the cakes are lobotomised versions of what they were before the business got sold and reinvented as a cross-country chain. Its decline is sad — now just a corporate shell of what it was. You can still get a decent cup of coffee, though. Great atmosphere... Good staff and fantastic cakes and coffee!